Still standing, this West Broadway theater has been subject to a series of unfortunate modifications. At the corner of 18th Street and Broadway, on the northern terminus of Dixie Highway, lie the concrete remains of the Royal Theater. 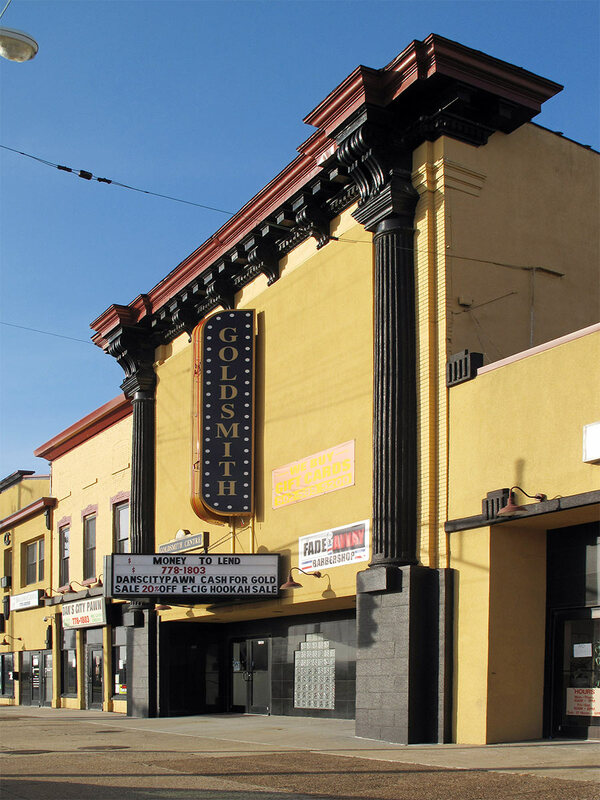 Considered one of Joseph & Joseph’s earliest ventures into the suburban movie palace market, the building was constructed circa 1911 and has since been subjected to a series of unfortunate cosmetic modifications. Early photos show the front entrance of the theatre flanked by Ionic columns to the sides, and a topped by a second story balcony trimmed with bas-reliefs of what appear to be vines, flowers, and cherubs, with a lighted “Royal” marquee in the middle. Above it all is an arched window featuring more flowery borders, and a crisscrossed parapet along the front edge of the roof. Today, practically all of the exterior details have been wiped away—even the Ionic volutes have been lost, giving the columns a Doric appearance. It’s now home to the Goldsmith Centre, which houses a pawn shop, dental clinic, nail salon, clothing store, and a daycare. Under new management, a vertical “Goldsmith” marquee was added to the front edifice, perhaps as a nod to its early days as a cinema. This week, the structure’s fate turned another page with news that owner Gus Goldsmith, who runs a high-interest loan business, will leave Louisville to focus on his ventures in Florida. As part of that shift, he has placed the Goldsmith Centre, and the bones of the original Royal Theater, on the market. The larger complex of properties comprising 29,000 square feet is listed for $1.8 million.